Have you ever thought of something or were presented something and you thought, oh how strange and decided to search the internet for it? Well of course you have! Everyone does it. I know I'm not alone on this one. Uses or claims to fame by many websites..
Metabolic disorders. The claim is that it stimulates intestinal cleansing. mmmm? Higher nutrients than cow milk. One site also sells camel milk. I read many years ago tales describing how arabian horses were fed camel milk, because of its rich nutrients. Another site states it has fruity undertones...sounds more like wine than milk. So 1 kg (2.2 lbs) will cost you approximately $92.00 USD, but wait...they say the price can be negotiated. 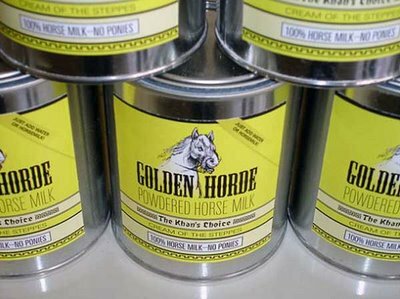 Start to Finish makes a Mare Replacer Powder and its made with..."contains proteins derived solely from edible milk ingredients...but doesn't state what kind of milk ingredients. This is getting more interesting as I go down this road. Ever hear of a product called Equilac, its a supplement made from horse milk and is recommended to help with various skin complaints such as psoriasis and eczema. The company that makes Equilac is located in Belgium and if I did the translation of euros to USD correctly, this for me would be a costly item. But then again costly is all in the view of the person pocket book. Well I must get back to work, but there you go...some utterly interesting uses for horse milk! I want to buy. how to do it?